The third time is usually a charm, but for Theresa Clarke’s students the seventh time is the ultimate charm in this year’s Google Online Marketing Challenge. The Challenge is a unique educational opportunity for students to experience and create online marketing campaigns for real clients using Google AdWords, Google Analytics, and Google+. Thousands of students and professors from almost 100 countries have participated in the past seven years. Although James Madison University earned six titles in previous Challenges, such as Americas Regional Business Winner, Global Social Impact Winner, and Global Social Media Winner, 2014 was its most victorious year. For starters, one JMU team earned the highest possible honor in this worldwide marketing competition – Global Winner! Ashleigh Rojanavongse, Rachel Lam, Lauren Hale, and Kaci Lassiter were named AdWords Business Global Co-Winner which means they were a top team in the world out of 2,540 teams. They also were named the Social Impact Award 3rd Place Co-Winner because of their work with a non-profit organization. The 3rd place social impact award includes a $5,000 donation for their client, Richmond-based FETCH a Cure, a nonprofit designed to provide pet owners greater access to information about pet cancer, senior care, and treatment options. Pictured left, James Carter, Monika Kelpsaite, Carly Calhoon, and Aly Wilkins were named AdWords Business Semi-Finalist & Social Impact Award 2nd Place Co-Winner, earning $10,000 for Cat's Cradle, a nonprofit organization in Harrisonburg, Va., that is dedicated to ensuring and maintaining a safe, compassionate community for cats and dogs. Pictured right, Rory Salzberger, Kelly Pollhammer, Melissa Kniceley, and Hannah Johnson were named AdWords Business Semi-Finalist & Social Impact Award 3rd Place Co-Winner, earning a $5,000 charitable donation for Shooting Touch, an organization based in Boston that is focused on harnessing the power of basketball to improve the lives of youth in the areas of health, education, and character around the world. Pictured left, Jonny Thompson, Melissa Jackson, Samantha Huff, and Jordan Epler were named an AdWords Social Impact Finalist for their work with Still Meadows Enrichment Center and Camp in Linville, Va. This nonprofit camp was created as a special needs facility in a country setting providing year-round therapeutic activities for children and adults with developmental and/or physical disabilities. 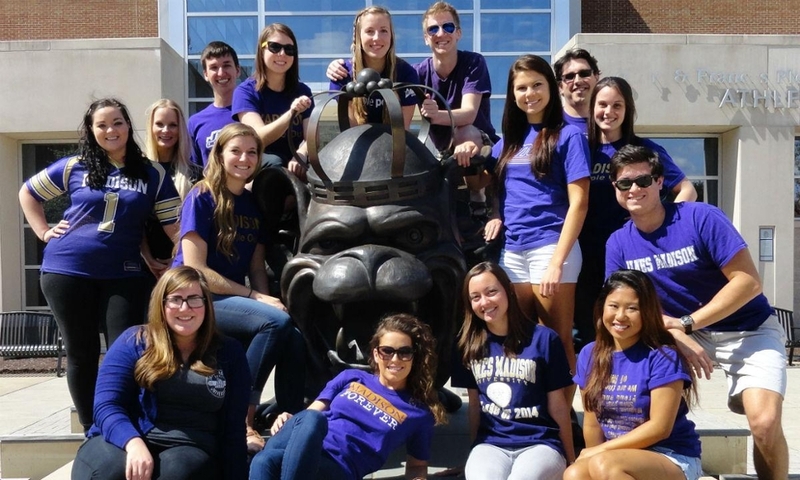 Congratulations to Dr. Clarke and her trove of talented JMU Marketing students! WANT TO HELP? If you are interested in becoming involved or in supporting future teams, please contact Department Chair Andy Wood, wood3ja@jmu.edu, 540-568-2332. If you would like more information about Dr. Clarke’s Internet Marketing Practicum course, please visit http://theresabclarke.com/gomc.